As observational and simulation capabilities enter a new era, the key role played by gas in the evolution of galaxies is becoming increasingly recognized. Improving our understanding of the role of gas is therefore a key challenge for the future. The Kavli Institute for Astronomy and Astrophysics (KIAA) plans to host an annual forum on the role of atomic gas, molecular gas, and dust in the galaxies from low to high redshift, as well as in the Milky Way itself. These annual forums aim to bring together active researchers for the purpose of reviewing recent achievements and discussing future frontiers. As galaxies are eco-systems of gas in different phases and stars of different ages, the forum also aims to improve interactions between researchers in different fields, and between observers and theorists. 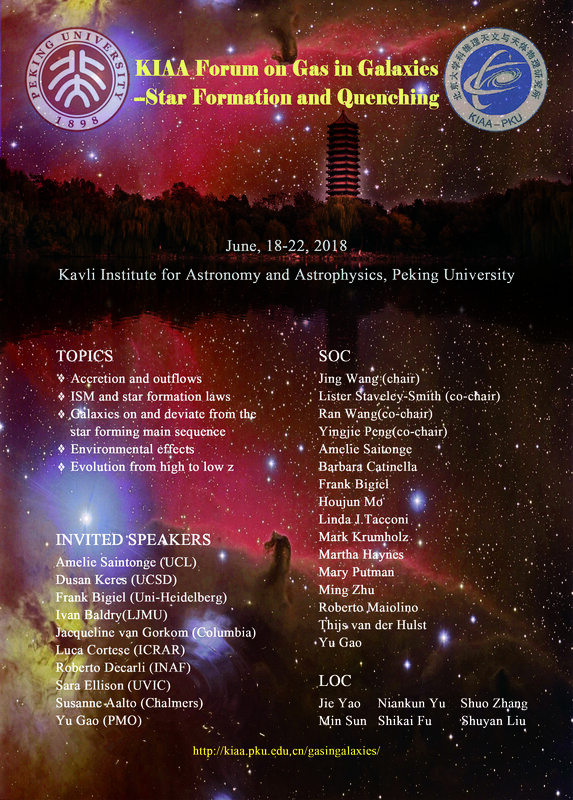 The first meeting of the “KIAA forum on gas in galaxies”, to be held on 18-22 June, 2018, with a focus on “Star Formation and Quenching in Galaxies”. The key condition for galaxies to remain star-forming is a continuous replenishment of the raw material, the atomic hydrogen (HI), either through accretion from the CGM or through merging of gas-rich satellites. The HI flows and accumulates under the combined influence of internal structure and external forces. It cools, is converted to the molecular phase, possibly traced by dust, further condenses and finally collapses to form stars, mostly under the regulation of sub-galactic physics. These steps form a basic picture of gas flowing from the IGM to being locked in the stars. For galaxies to be quenched, it is necessary to cut the flow of gas in any steps described above. Processes that remove or heat the CGM can prevent the HI accretion and strangulate the galaxies; environmental effects from groups and clusters can remove the HI from the galaxies; while feedback from the stars and the active nuclei may efficiently reduce the cooling efficiency of the gas.